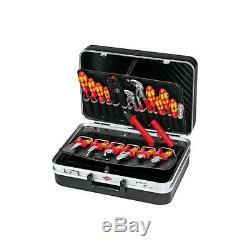 Tool Case "Electric" Knipex + 20 Electrical Tools Electrician Electrical Trade. 002120 Tool Case "Electric" + 20 Electrical Tools. Heavy duty ABS material, black. With circumferential double aluminium frame. Register hinges working as lid holder. One removable tool board in the lid with 15 push-in compartments on the bottom side and six big push-in compartments and a clamp compartment (400 mm width) on the lid side, fixed by push-button. Base tray, height 58 mm, can be subdivided by flexible inserts- cover plate with six large push-in compartments, can be fixed by popper. Cover and tool plate made of Con-Pearl® material. Dimensions, exterior (W x H x D): 480 x 180 x 365 mm dimensions, interior (W x H x D): 415 x 160 x 300 mm. With 20 brand name tools, partly VDE tested according to DIN EN/IEC 60900. We are continually expanding our range and offer our customers a quality product at a reasonable price. A large selection of our products are manufactured under our own brand "Blue Bar" and all other products come from reputable manufacturers. Wahankh Pty Ltd Blue Bar Industries Aussie Online Bargain Warehouse Find us on Google. Wahankh Pty Ltd trading as Blue Bar Industries acn: 167 220 902 We are an Australian owned and operated company located in Caboolture QLD. The item "Tool Case Electric + 20 Electrical Tools Knipex Brand Electrician Data Trade" is in sale since Monday, May 14, 2018. This item is in the category "Home & Garden\Tools & Workshop Equipment\Hand Tools\Other Hand Tools". The seller is "blue_bar_industries" and is located in Caboolture. This item can be shipped to Australia, United States, United Kingdom, Japan, Canada, Germany, Hong Kong, France, New Zealand.